This image instantly captivated with it's large shapely branches, greyish textured wall and (Mad et Len?) bottles. But even more intriguing is that I cannot find it's original source and author? It's is insanely important that creatives are given credit for their work so leaving this anonymous is simply not good enough. and I'm happy to share (with the help of my amazing readers) that this was shot by photographer Line Klein for Oliver Gustav Studio. If anyone knows can you please tell me? I'd love to be able to credit and share whoever thoughtfully captured this is. Thanks for your help everyone! Jennifer! 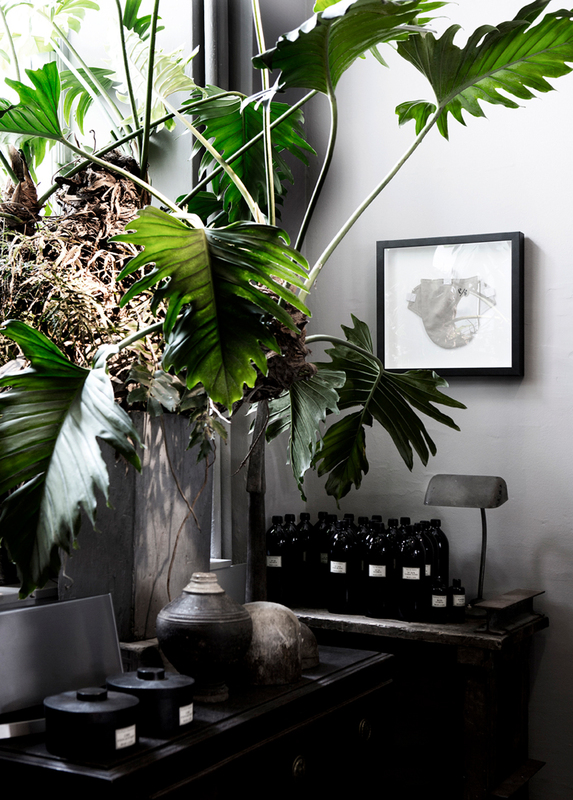 this pic is from Oliver Gustav atelje in copenhagen, the store is amazing, so next time you visit you have to go there.. sadly i don´t know the photographer but it´s been published in rum magazine a while ago, hope you find the source. I love how quickly the answer surfaced! Gosh, the internet is cool. Beautiful shot! Thats a lovely pic. Love the shades and textures of the vintage pieaces. You could find all over the place those leaves over here in Costa Rica. I need one in my home! !